The whereabouts of the leader of Indigenous People of Biafra, IPOB, Nnamdi Kanu, has been the concern of Nigerians, especially among political observers. Facts have emerged that Nigeria president, Muhammadu Buhari, may have questions to answer from stakeholders in the country and with the international community over his whereabouts. Kanu had on September 8 met with the South East Governor’s Forum in Enugu, the capital of Enugu State over the agitation on IPOB. His second meeting with the forum was aborted due to the invasion of his home by members and men of 145 Battalion, 14 Brigade of the Nigerian Army, Ohafia. The IPOB leaders home were invaded by the Nigerian Army with armor tanks and heavy weapons and killings, abuse and molestations were reported. After the invasion of the IPOB leaders home, the Nigerian Army declared IPOB and other pro-Biafra groups as terrorist organizations, referring to the activities and actions of its leader, who according to court papers was due to appear in court in mid-October. In furtherance to the military declaration, a Federal High Court in Abuja granted an order proscribing IPOB group. The IPOB group question the constitutionality of the order and many countries like France and Britain rebuke the idea of the group as a terrorist organization. The pertinent questions hovering over president Buhari is whether he understands the tenets of democracy and separation of its executive powers from other branches of government. Following the unknown whereabouts of the IPOB forerunner, the leadership of the group alleged and insisted that the Federal Government and the military of the country must account for their leader’s whereabouts. IPOB alleged that Kanu is currently in the military’s custody. But speculations in the country had it that the military might have killed the IPOB leader after he was arrested in the raid at his house. Owing to this, the government of United Kingdom requested Nigeria government to clarify the status and whereabouts of the leader of the Indigenous People of Biafra, Nnamdi Kanu. The British government asked Nigerian government if the British national was alive or dead. 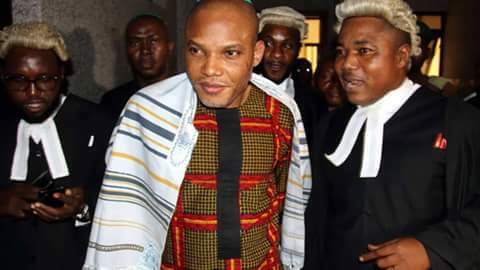 The Press Officer, UK high commission in Nigeria, Joe Abuku, stated that the inquiry followed reports that Kanu had been missing since September 14, 2017, when armed soldiers stormed his residence in Abia State. “We are seeking urgent clarification from the Nigerian authorities about the status and whereabouts of Mr. Kanu, a British-Nigerian man, who has been reported missing since September 14”. He also clarified that British government was not in tune with Nigeria government’s proscription of the group. “The Indigenous People of Biafra is not a proscribed organization in the UK,” the mission spokesperson stressed. Meanwhile, the United States had earlier said it did not consider IPOB a terrorist group and urged Nigerians to de-escalate tension and embrace peaceful resolution of grievances. But in what appeared to be a voice for the federal government, a former governor of Abia state, Mr. Orji Kalu, claimed that the IPOB leader has escaped to London through Malaysia. “Kanu was not taken away by the military. Kanu went to Malaysia from where he traveled to the United Kingdom. Nnamdi Kanu is in London right now as we speak. He was not arrested by anybody. He left the country on his own”, Kalu said. The development ferried another facet of a quagmire in the South East region of Nigeria as the IPOB promised to make life unbearable for the former governor whom they claimed was working for the president of the country. The big questions are, does the president of Nigeria elected by the people has the absolute right to order the killings and kidnapped of its citizens or is the president acting outside the ambiance of his powers? There are indications that failure of the president to address whereabouts of the IPOB leader may soon degenerate into a critical situation in the country and the international communities are watching the developments very closely. Caracal Reports observed that stakeholders in the country, especially from the Eastern region are currently apprehensive that the situation on the ground created by the Nigerian president might lead to chaos in an already tensed country ravaged by economic depression and hardship. “The current situation which appeared to have been doused by military and Buhari has a serious undertone than what people are currently seeing. With Kanu’s whereabouts unknown to everybody, do you think it is ordinary? Just pray that more calamities do not befall the country. With the manner Buhari is running the country, everyone is concerned because we are not safe”, Titus Calistus, an activist said. He also noted that the president needs to address questions on the whereabouts of IPOB leader to give a clear indication of the position of his government on the issue if he wants total peace in the country. Meanwhile, further findings by our correspondent have also shown that several groups from the Southern region of the country are already in support of the IPOB group. The Oodua People Congress had warned the Buhari led government over how the issue concerning the IPOB was being handled. They said the government, if not careful may plunge the country into a serious problem. A statement issued by the group and signed by its Publicity Secretary, Yinka Oguntimehin, said the agitation of IPOB could be fruitfully addressed through dialogue rather than the military option adopted by the Federal government. OPC said it did not believe there was any security threat in Umuahia and its environs to warrant the deployment of soldiers to intimidate and molest innocent Nigerians who were going about their lawful business. A chieftain of the group who spoke with Caracal Reports, Waheed Ishola, said the group would soon ventilate its position on the government’s silence over the whereabouts of the IPOB leader. “Soon we will come out with our position on the need for the president to address the issue. Nigerians need to know Kanu’s whereabouts because failure on this means a lot”. The Ohanaeze Youth Council also warned the federal government that if the causes of the agitation that led to the disappearance of the IPOB leader were not addressed, another group might emerge. The Ohaneze President, Mazi Okechukwu Isiguzoro among others executives said it was not averse to any action that would end the marginalization of Ndigbo in Nigeria. It was also gathered that the position of the group seems to be in correlation with speculations in the country that the leader of IPOB is already in synergy with Niger Delta group to form a formidable group. Speaking on the development, a former Minister of Education, Prof. Ben Nwabueze, condemned the manner at which Nigeria government has handled the situation. The elder statesman described the situation as “a matter of grave concern” saying the situation in the country called for great restraint on the part of all. “The earlier siege on Mazi Nnamdi Kanu’s Umuahia home by soldiers of the Nigerian army is a matter of grave concern because it occurred at a time the country is facing destabilizing crisis and threats to its peaceful co-existence”. Chief Martins Onovo, the presidential candidate of National Conscience Party in last presidential election, said the family of the IPOB leader and international community should hold the military and federal government responsible for whereabouts of the IPOB leader. “We know he was in his house when Army went there. There is no doubt that army needs to answer the question of his whereabouts because we have a video clip that showed he was there when the army was in his house. We need to investigate the case. There are allegations that army took him away, but the army said they don’t have him, and that is why I said we have to investigate the case. The issue has already put us in a bad light. Already there is an allegation that he has been killed. If this is true, the international world will not pardon us. You know that international world has accused our government of killing people secretly and anyhow. So, we can’t just continue like this. This country cannot be run like Banana Island. This is a man who had a case in court. All they needed was to wait for him and come to court, but instead, they launched a python dance at him, what is it for? All the innocent people they have killed what have they gained in it. The president and the military need to answer the question”, he said. He also expressed concern over the recently discovered illegal shipment of arms into the country, which may be connected, with activities of IPOB. “The recent increase in the shipment of arms and ammunition into the country through the seaports is giving the government serious concern and the government intends to probe how these arms and ammunition entered the country. “We are going to declare a manhunt for those who sponsor these groups and import arms and ammunition into the country”, he said. The leader of the Movement for the Actualization of the Sovereign State of Biafra, Chief Uchenna Madu, said the IPOB are non-violent bodies seeking the realization of the Biafra state. “We have no intention of taking to arms struggle; we are non-violent groups. They are calling us terrorists but we are not arm-carrying groups. He also disclosed that the action of the Federal Government had increased the interest of international communities in the Biafra agitation. “As a matter of fact, because of the recent happening, the international support concerning Biafra has increased,” he added. “The label is government’s antics to suppress us, but nobody can destroy Biafra revolution. It is an ideology, which nobody can separate from an Igbo man,” he argued. On the proscription of pro-Biafra groups, he described it as nothing but “rubbish”. “Nobody can ban or proscribe the groups. Neither the Southeast governors nor the court established IPOB, and you cannot ban what you did not register. However, Caracal Reports’ efforts to speak with President Buhari’s spokesperson, Femi Adesina on the issue was not successful as calls put through him received no response.